When you launch Toon Boom Harmony connected to the database, you can have access to the Palette Operations dialog box. The Palette Operations lets you clone, rename or delete palettes. 1. Launch Toon Boom Harmony and login on the database. Refer to Connecting to the Database. 2. Click on the Close button to close the Database Selector dialog box. 3. Select Tools > Palette Operations. The Palette Operations dialog box opens. 1. Select the palette you want to clone at the location and level it was stored in. 2. Click on the Clone button. 3. A Warning dialog box opens. ‣ Click in the checkbox beside Don't show this message again if you want to prevent the dialog box from opening every time you do this operation. 4. Click on the Yes button to continue or click on the No button to cancel the palette cloning operation. The Palette Browser dialog box opens. 5. Select the location level where you want the new palette to be stored. 6. Name the new palette. 1. Select the palette you want to rename at the location and level it was stored in. 2. Click on the Rename button. A Warning dialog box opens. ‣ Click in the checkbox beside Don't show this message again if you want to prevent the dialog box from opening every time you click on the Rename button. 3. 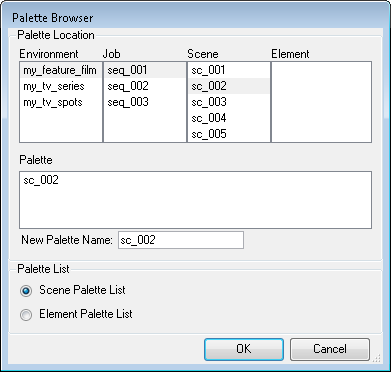 Click on the Yes button to continue or click on the No button to cancel the palette renaming operation. The Rename Palette dialog box opens. 5. Click on the OK button. 2. Click on the Delete button. A Warning dialog box opens. ‣ Click in the checkbox beside Don't show this message again if you want to prevent the dialog box from opening every time you click on the Delete button. It is not recommended to disable the warning message in this case. Deleting a palette can not be undone. 3. Click on the Yes button to continue or click on the No button to cancel the palette deleting operation. • Connecting to the Database.